It seems that every time Attorney General Jeff Sessions threatens to enact his anti-marijuana agenda, there’s a handful of lawmakers who fight back by introducing new pro-cannabis legislation. While their intentions are good, it often proves to be an exercise in futility since cannabis bills rarely see an up or down vote. Why is a mystery, but it’s reasonable to guess that there are still too many elected officials who would rather capitulate to Sessions’ agenda than risk alienating their anti-marijuana campaign donors. The only other reasonable explanations could be ignorance or a lacking sense of urgency — after all, states are taking matters into their own hands without the blessing of the Federal government. With all that’s going on in Washington, it’s likely to take relentless pressure from the voting public to get lawmakers to stop the madness. It’s not enough that a vast majority of Americans favor regulation if they aren’t compelled to pick up the phone and urge their representatives to take action. That’s unlikely to happen unless constituents realize just why it is so important and how U.S. drug policy has done more harm than good. That’s why we dedicated the last few episodes to exploring the broad-reaching impact of unjust drug policy. On the global front, we spoke with Mexico’s former President Vicente Fox about the disastrous diplomatic consequences of U.S. Drug policy devastating loss of life caused by military-style enforcement tactics. On the domestic front, we delved into the sinister political motives of the Controlled Substances Act with the founder of NORML, Keith Stroup. On the judicial side, we heard from Judge James Gray about the overblown expense of military-style enforcement and injustice of sending people to prison for minor drug offenses. This week, we delve into the forgotten victims of our unjust drug policy, patients branded with felony convictions for marijuana offenses. These are individuals whose lives were destroyed and whose families were ripped apart when they were arrested, tried and convicted. After enduring the nightmare of prosecution and time behind bars, they must endure the stigma and limitations of a felony conviction for the rest of their lives. Ex-cons get zero sympathy from Congress and, since they’re often stripped of their right to vote, they have no say when it comes to voting for policy change. Our guests, Chris and Andrea Martin, explain how their friends helped them to survive the hardship of incarceration and how the changing industry enables them to thrive today. 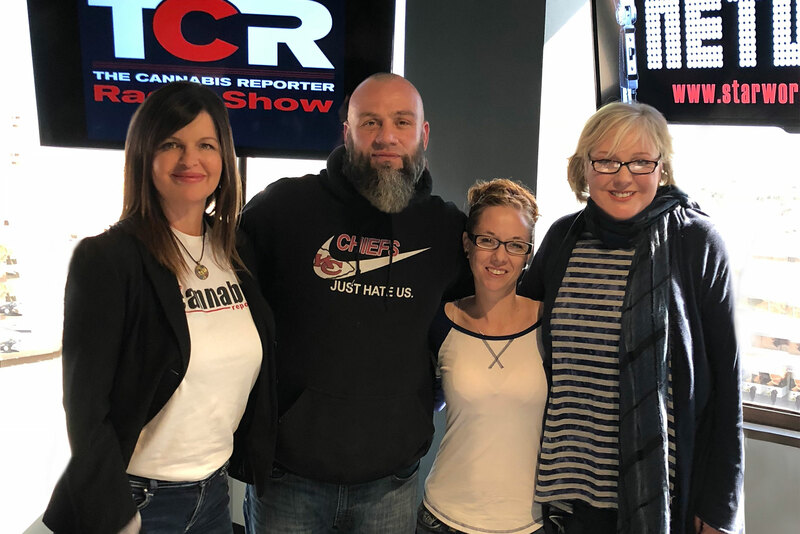 Before we get started, you’ll be introduced to TCR Publisher Star Simmons, who has never been on the show before, but who is so much a part of it behind the scenes that we think of her as the backbone of our operation. It was important for us to acknowledge her contributions today not only because she was inspired by Chris Martin’s story, but also to wish her a Happy Birthday! We were delighted she could join us for this interview. TCR Publisher, Star Simmons (Left), Chris and Andrea Martin (Center) and host Snowden Bishop (Right). Chris Martin discovered therapeutic benefits of cannabis before any state had passed medical marijuana laws. As a young man with a baseball scholarship and bright future in front of him, his life forever changed when he was arrested for having a single joint in his dorm room, convicted on felony marijuana possession charges and sentenced to 5 years in prison. 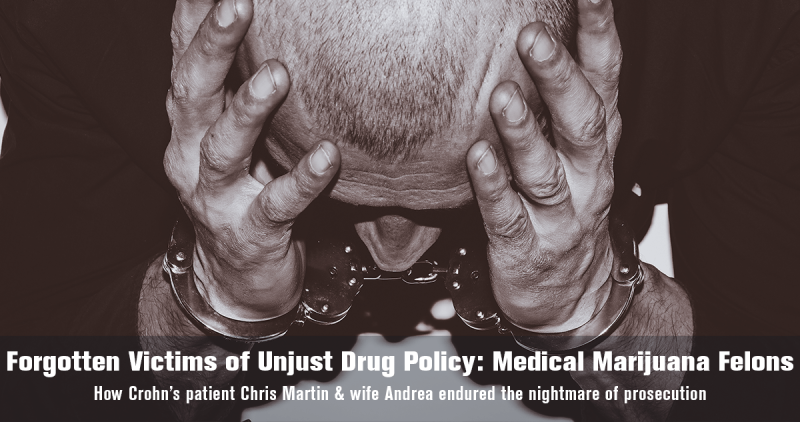 Several decades later, Chris and his wife Andrea (Andy) became victims of the criminal justice system again when a partner in their medical marijuana edibles company was caught conducting shady business on the side without their knowledge. Despite being licensed to cultivate and sell cannabis under Arizona’s then-new medical marijuana program and his copious efforts to comply with state rules, his partner’s testimony catalyzed a “perfect storm” of events, which led to his second conviction on multiple counts of felony marijuana offenses. Due to his prior conviction, Chris received a sentenced of 130 years in a maximum security prison, but that was reduced to two years after a private investigator implicated the arresting officers in a related conspiracy. Since his release from prison, Chris and Andrea have revitalized their company, Hempful Farms & Café and added a new line of supplements for pets called Paw Buddies. As patient advocates and champions for the forgotten victims of unjust drug policy, they devote much of their time educating the public about cannabis and lobbying for change so others won’t have to endure the anguish of prosecution.